Our research* shows 100% of employers want healthy employees that show up for work. Using a computer or mobile device, patients select their medical or behavioral health condition supported by their physician, and answer specific questions to communicate their care need to their physician. In less than two minutes, the physician can review the patient request and respond with care instructions or, if necessary, instruct the patient to schedule an office visit, visit the ER, or schedule a telemedicine video conference. Access the Synct software on your computer, smart phone, or anywhere you have a device connected to the Internet. With Synct, Medical Care is Office Optional. Synct supports over 35 Medical and Behavioral Health Conditions. Synct allows full flexibility of which conditions you wish to support. Asynchronous Telemedicine that is Efficient. Replace patient telephone calls and EMR unstructured emails for care, follow-up questions, and prescription refills with a structured method for efficient communication. 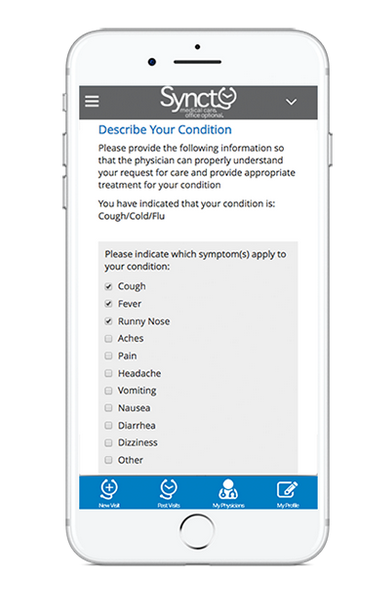 Through a secure and structured set of questions, patients will submit their request to their physician from a computer or mobile device. Within hours, the physician can review and respond to the request. If an office visit is necessary, the provider can instruct the patient to schedule an office visit or to schedule a video conference through Synct. An easy-to-use, HIPAA-compliant Video Conferencing Solution with record storage. 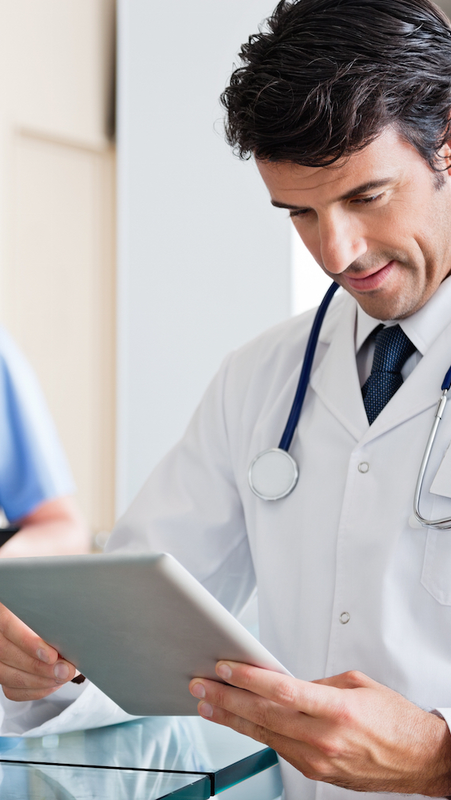 Synct Video Conferencing allows complete flexibility for provider or patient scheduling. Providers can choose to pair Video Conferencing with Asynchronous or have their own secure Video Conferencing room. Synct Video Conferencing is efficient and tailored to how you want to use it. When you choose Synct as your virtual care solution, one of our Client Services Managers will be assigned to you and will contact you to discuss the next steps in implementing Synct. We look forward to helping you improve office efficiency and patient experience for your practice! You will receive access to online virtual training videos for you and your staff. Upon completion of your online training, your assigned Client Services Manager will schedule a WebEx discussion for any further questions you and your team may have about implementation. Training takes less than an hour to start using Synct. Once you and your team have completed online training, it’s time to start providing virtual care to your patients! It’s time to promote Synct to your existing and new patients. During On-boarding, you will gain access to our Outreach and Promotion Plans to help you get the word out that you are now offering virtual care with Synct. These plans include Marketing tools, preparation checklists, and other useful resources that will assist you in promoting Synct. You and your team will receive monthly reports of your success, and you will have access to our Tech Support Team at no additional cost. Our team is here to support you and your organization every step of the way as you begin offering virtual care. Explore how you can white-label Synct to make it your own. Ready to learn more about customizing Synct to your organization? Complete the form below, and we will be in touch with you! Invest 15 minutes to advance your organization. See a demo to learn more about how your organization can be enhanced by Synct.